Buy "NINTENDO QUEST" on DVD! VGMaps > General Boards > Gaming > Topic: Buy "NINTENDO QUEST" on DVD! 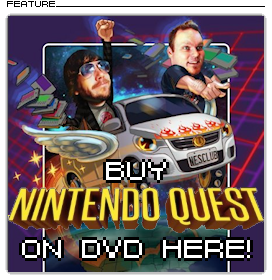 BUY "NINTENDO QUEST" ON DVD HERE! As I have probably made you all very well aware this year, I was involved in the "Nintendo Quest" Power Tour and helped to bring a theatrical screening of Rob McCallum's documentary film "Nintendo Quest" to Edmonton, Alberta, for its only Western Canadian screening this past October. Now for those who haven't seen it, it is now available on DVD, and I am selling them on ebay. "Nintendo Quest" follows video game fanatic Jay Bartlett as he attempts to collect all 678 NES cartridges within one month - and without online purchases. He therefore goes on a road trip across Ontario and the United States, hoping to fulfill his dream. Besides seeing him undertake this challenge, director Rob McCallum examines the enduring legacy of the Nintendo Entertainment System. I also wrote a review here. It's obviously a great film for any NES fan or collector, but even non-gamers can enjoy it too. Why not buy yourself a copy, or get it for a fellow gamer for Christmas?